Princess Eugenie married Jack Brooksbank at Windsor Castle and followed it with more than one star-studded royal wedding party with fairground-themed festivities. Finally, Princess Eugenie and Jack Brooksbank are pictured at Royal Lodge, Windsor, ahead of a private dinner. Mother of the bride Sarah Ferguson joins other members of the royal family and the groom's family for an official photo. 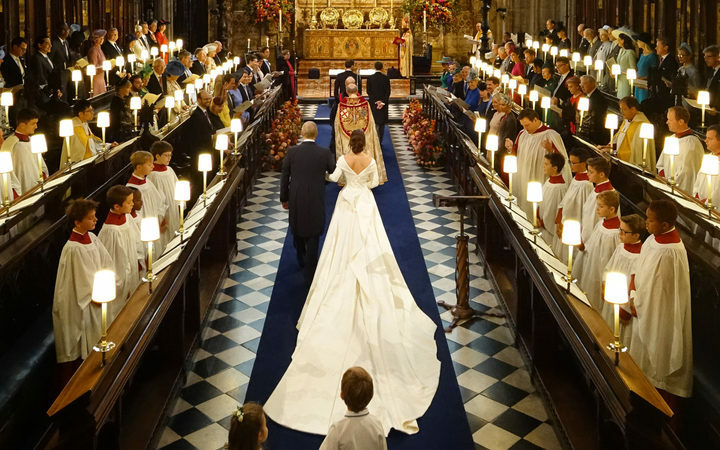 The bridesmaids and page boys, including Prince George and Princess Charlotte, arrive for the wedding of Princess Eugenie of York and Jack Brooksbank in St George's Chapel, Windsor Castle, near London, England, Friday Oct. 12, 2018. They include Prince George and Princess Charlotte, the children of Eugenie's cousin, Prince William, and Kate, Duchess of Cambridge. He also took inspiration for the design from the White Rose of York. Rather than the neatly styled bun, she wore for during the ceremony, Eugenie instead wore her hair out, held back with a hair slide that belongs to Her Majesty The Queen.